At Spark Logix we’re big fans of WordPress, so when we come across an incredibly useful plugin that integrates seamlessly with the CMS, we can’t help but talk about it. Such is the case with WooCommerce — an eCommerce toolkit that can transform your site into a full-fledged online store. If you’ve been struggling to come up with an eCommerce solution that works for both you and your customers then you can’t go wrong with WooCommerce. As mentioned, Woocommerce works flawlessly with WordPress, but what’s even better is it was designed specifically for the CMS’ functionalities, so all of the UI matches what you’re used to seeing on WordPress and is comfortable to use. This instant familiarity makes for a very short learning curve, enabling you to get things up and running quickly. There’s virtually no part of the sales process you can’t tweak to your liking. You choose how your product content appears, configure tax and shipping settings to your needs, select how to accept payments, customize email notifications, and much more. You can even designate whether products are physical or digital, and the application will know whether to arrange traditional shipment or initiate a digital download. To have a successful online store you must carefully monitor everything that’s going on with your business. Woocommerce makes this easy by providing detailed reports that give you overall performance data as well as more specific information, such as daily sales, monthly sales, top sells, top earners, and stock. There are even widgets that make it possible for you to keep track of certain elements right from your WordPress dashboard. In addition to the perks above, Woocommerce solidly delivers all the standard features you’d expect from an eCommerce tool, such as multiple shipping and tax options, customer accounts, coupons, and advertisements. Dynamic Pricing – Allows you to set up four different types of bulk discounts. 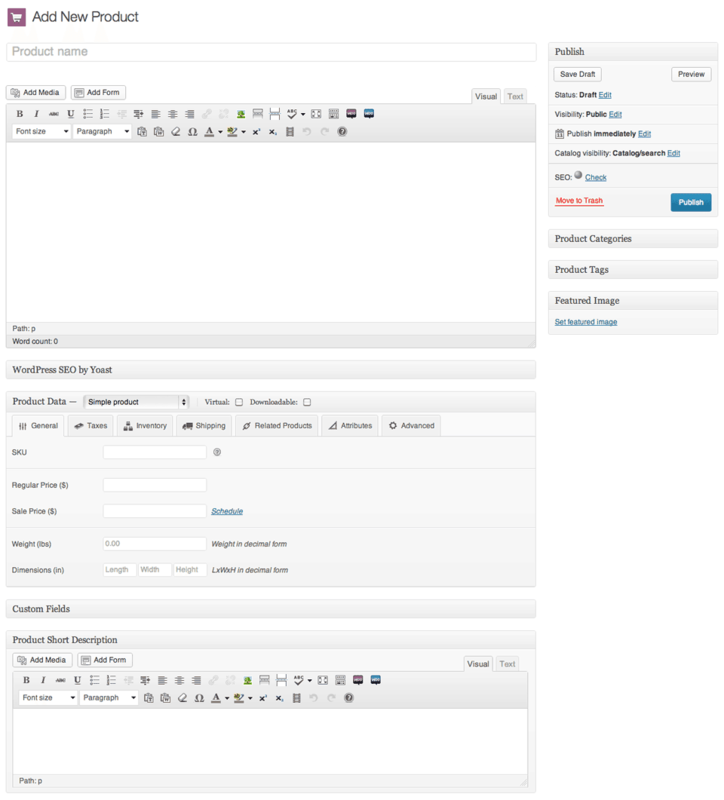 Gravity Forms Add-on – Enables advanced product configuration forms to give you more control over how prices display and calculate. Per Product Shipping – With Per Product Shipping you can designate separate shipping costs for individual items in an order (useful for one-time sells and heavy or large items). Table Rate Shipping – This extension adds more options to what comes standard with WooCommerce. Customize rates by location, price, weight, and item count. You can download and install the WooCommerce plugin just as you would any other WordPress plugin. Once the plugin is activated, you’ll see two new menus (“WooCommerce” and “Products”) in the navigation menu on your dashboard. Click on the “WooCommerce” menu to get started. 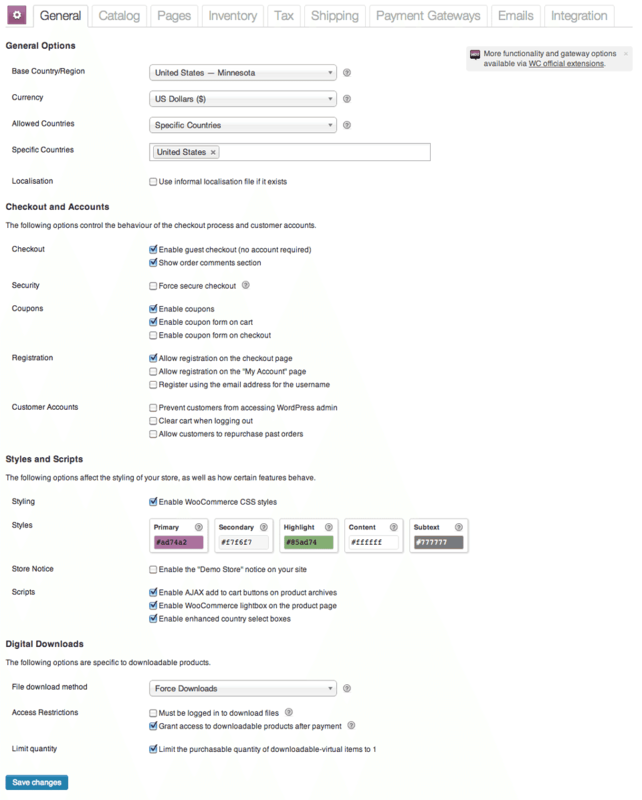 Within WooCommerce, you’ll see four other categories: Settings, Reports, Orders, and Coupons. 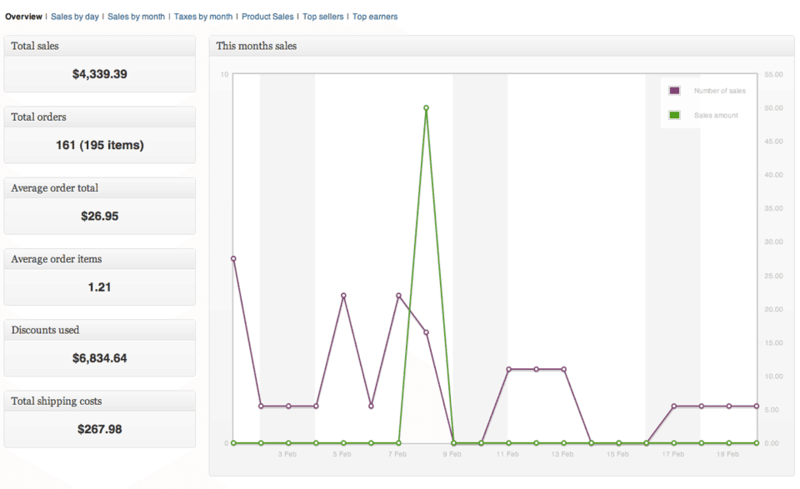 Simply click on each category and work your way through the tabs listed at the top of the page to configure your shop. One thing you’ll immediately notice is the layout and tabs look and navigate just like any other page in WordPress, so if you’re familiar with WordPress you shouldn’t have any problems setting up your store. Once you’ve worked through all the pages under WooCommerce, it is time to add your products by clicking on the “Products” menu. Under Products you’ll see additional categories, including Products, Add Product, Product Categories, Tags, Shipping Classes, and Attributes. To add your first item, just click the “Add Product” category. Again, you’ll see the page looks very familiar, as it resembles an ordinary WordPress Post or Page edit screen. So, adding your products should feel quite natural, but make sure to pay attention to the “Product Type” dropdown menu where you can specify whether your product is simple, grouped, external/affiliate, or variable. Ecommerce is big business (around $200 billion in the U.S. alone), but to get a piece of the action you need an online store that is easy for you to manage and instills confidence in your customers. Otherwise, consumers will merely click away to a competitor’s store where shopping is simple and fast. And the best way to provide such a site is through a smart eCommerce application where everything you need is built in. Although there are other great eCommerce solutions out there (like Magento, which we also recommend), WooCommerce is a great choice for businesses wanting a free tool with comprehensive features that work brilliantly with WordPress. I have a wonderful wife, daughter, and son that I spend my free time with. Currently living in MN, and spent all of my working hours on WordPress sites. I love building WordPress sites, and I continue to learn more with every website built.